For language to have meaning, there must be intervals of silence somewhere, to divide word from word and utterance from utterance. He who retires into silence does not necessarily hate language. 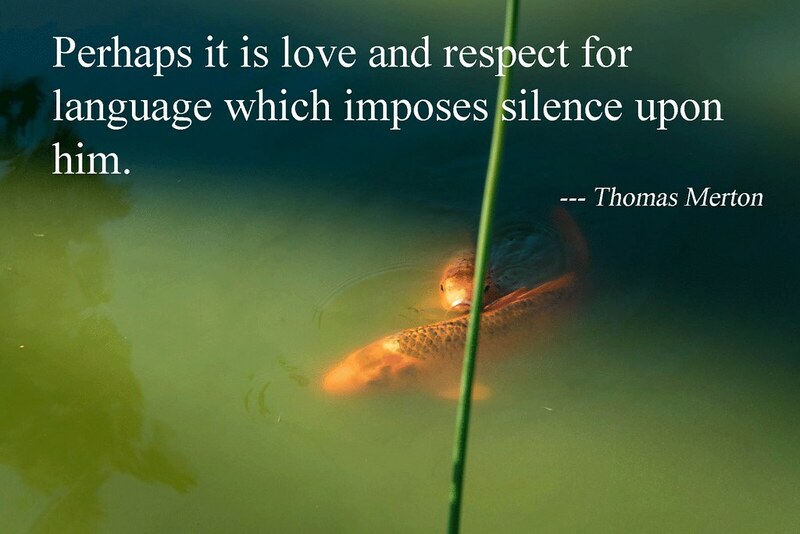 Perhaps it is love and respect for language which imposes silence upon him. For the mercy of God is not heard in words unless it is heard, both before and after the words are spoken, in silence. TS Eliot and Thomas Merton were both writers who spent a lot of their lives and writings searching for the ultimate meaning of life. They chose different paths. Merton was born in France and made his way to the US and became a citizen. Eliot, on the other hand, was born in St. Louis MO and immigrated to England where he became a subject of the Queen. Eliot married twice and dedicated his life to his wives and poetry. Merton joined the Abbey of Gethsemane and became the most famous writing Monk of our time. These great writers left us with a treasure trove of great literature. They were different but the same. The above quotes inform us that they had a commonality of thought about silence and meditation. Their joint cry is that we hear and see the most when we cut ourselves off from the language and light that surround us. That cutting off is called by different names, silence, contemplation, meditation but it always has the same end desire, to communicate with something, someone outside of ourselves. We all have an inbuilt desire to discover our true selves that God created. We are bogged down, stitched up with the learning and cares of the world, and we all know there must be something more. That more only exists when we move beyond. 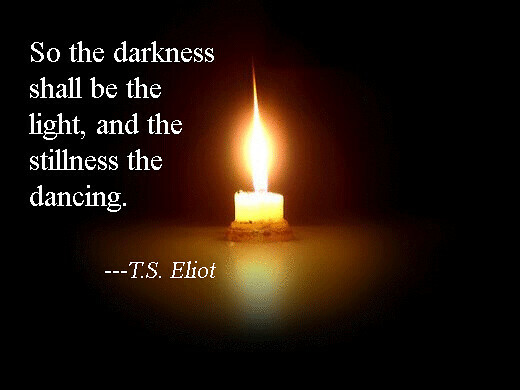 Eliot stresses the need to allow ourselves to be swallowed in the darkness so that the light might manifest itself. He aptly states that if we create our own hope it will be a prejudicial hope that is wrapped in our own desires. Only when we allow love that is not purely self-love enter, can we see light rise from darkness. Merton reminds us that we are noise machines who seek to fill in every void with more noise. For our language (noise) to have any meaning there must be times of silence that allow us to digest what we have taken into our souls. That silence is the time when we experience divine translation of human noise. In the brightness of the light of God sometimes our utterly meaningless sound becomes the voice of God. Seek the dark silence today so that you might experience the light. Lord, lead me to a time of silence and holy darkness that will allow me to get a glimpse of your light. It is the light that illuminates beyond my imagination. Allow me to silently bask in that light so that I may see you more clearly.